The Temperance Thermometer was an engraving widely used in temperance publications. 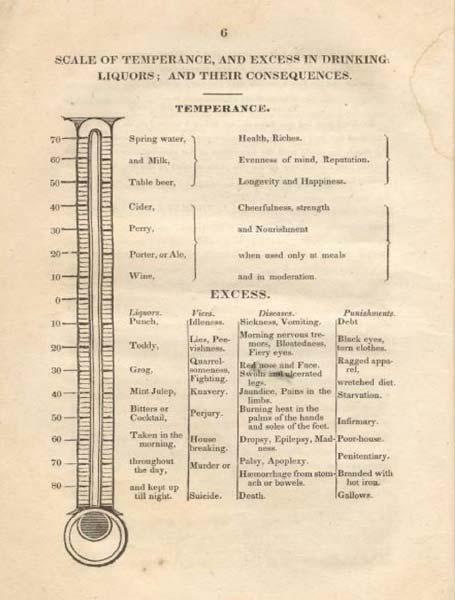 Using scientific imagery (the thermometer had only recently come into widespread use) it provided a graphic way of describing the impact of liquor on health and well being. At the top was “Spring water” and “Health, Riches” – at the bottom was drinking hard liquor day and night, along with “Suicide, Death, the Gallows.” In between were beer, cider and wine “in moderation,” and then ever-descending levels of rum, whiskey and degradation. This Thermometer allows for moderate drinking; total prohibition advocates would have put everything from “table beer” on down into the realm below zero.